In 1882, William Willis of Bromley in Kent took out the first patent for platinum-coated photographic paper. Platinum-family elements are among the most unreactive in nature, and an image printed on to the specially treated paper was as permanent as the paper itself. Platinum-printed photos also had a distinctively soft black-and-white contrast popular with photographic artists of the time. In 1879, Willis founded the Platinotype Company advertised here, beginning to mass produce his photographic paper. 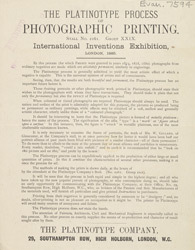 His company also sold licences to photographers, allowing them to use the paper and the relevant printing technique. This method of printing lost commercial popularity during the World Wars, when platinum could not easily be exported from or around Europe, but it retains a certain cachet among artistically-minded photographers to this day.